Brain Sync recordings created by Kelly Howell have been clinically tested with a record-breaking 95% success rate and are offered to patients at America's most prestigious cancer treatment hospitals, Memorial Sloan Kettering and Dana Farber. After more than two decades of clinical research, Brain Sync is revealing itself to be a great breakthrough in healing and mind expansion. Until recently, entering extraordinary states of heightened receptivity and peak performance has been attained predominantly by only a disciplined few, practicing ancient techniques such as meditation, chanting, yoga, and newly revamped versions of the mystical traditions - for example, progressive relaxation, auto-suggestion, hypnosis, and biofeedback. These techniques do work. But they take long periods of practice, discipline, and sometimes a leap of faith. It is all too easy to become impatient and give up long before producing positive results. 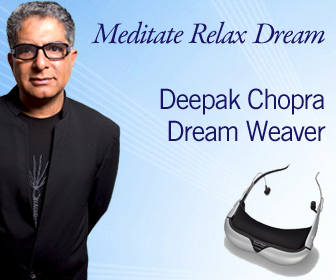 The Deepak Chopra Dream Weaver uses light and sound pulses at specified frequencies to help the user reach a variety of interesting and beneficial states of consciousness. The effect is very much like the relaxed and focused effects one gets from meditation, biofeedback / neurofeedback, Hindu Kirtan, Gregorian chanting, Hebrew davening, Tibetan prayer bowls, Native American drum circles and rain chants, Sufi chants and Whirling dervishes, and African trance dancing.